Such a cool and fun look! I like this kind of shorts, so comfy and airy, perfect for the hot weather. Hope you had a nice NY celebration, here's to fun and happy 2019! Thanks! With 2 under 5 I had a quiet one - asleep in bed! haha! I bought similar pairs of shorts to both of these last year and I was SO glad to have them! This style really is the best for beating the heat! Clever idea to use your scarf as a kimono! They are so perfect in summer, definitely! Cute outfit and love the bag. 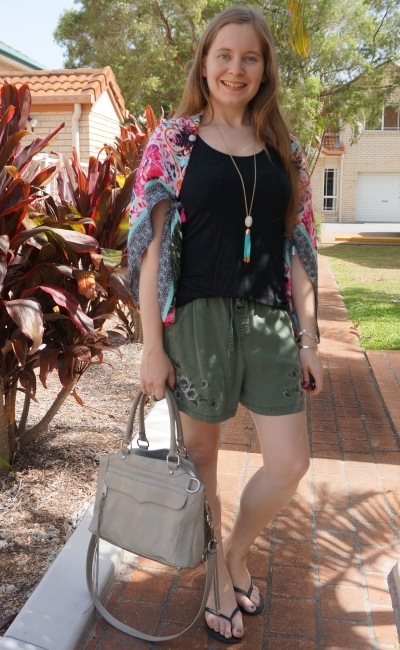 I love adding a breezy printed kimono over an summer outfit- so cute! You have the best kimono collection! I am in love with both prints! My mom loves that trick to make the scarf into a kimono!! It makes such a great idea especially for travelling, and then at least it stays in place!! Love these shorts looks! So nice! Happy New Year! Super cute as always:) So love the idea of using a big scarf as a kimono. Very creative:) And also love how you mix prints, Mica. Hope you all had a lovely New Year celebration! haha it's so hot here! And humid! Height of summer! That pretty pink floral scarf is gorgeous and it looks so chic worn as kimono. I'm so envious of your warm summer weather right now as we're in the midst of winter and it's gotten cold. Happy new year to you and your family Mica! Wishing you all the very best in 2019! So lovely how you tied that big scarf to make a scarf. It does make for a pretty kimono. Your outfit is fantastic, love your military green shorts. The second outfit is very pretty as well. I do like how you pair shorts and kimonos. You're right, kimonos are perfect for warm weather. They are a great pop of colour, they offer protection against the sun and they are pretty light- so they're really perfect for summer. p.s. That bag looks great after five years of wear. Thanks Ivana! It is a great bag, and kimonos are the best! Hope you had a great holiday week. Love the Kimono. After watching the video I can say that the RM grey bag had held up really well! RM is very good quality, I think you made a great investment. That bag has a lot of life in it. If you ever get tired of the color you can always dye it. Very true, although I've never dyed a bag before myself! Your kimonos are always so lovely and nice. You've a good eye!! Wish it was summer over here already. Ha!! Loving the comfort Mica. Happy New Year! I have never try wearing a scarf as a kimono before. I have worn them as vest before. These are both such great summer looks! I love how you turned the scarf into a kimono in the first look--how creative! I also love the necklace paired with the look in the second one--it really brings out the colors in your kimono! What a lovely kimono's, and that colorful necklace is very cool! Lovely looks, you radiant Summer! A kimono is a great way to cover the shoulders and get lightweight sun protection that way. Oh, how I miss summer! haha won't be long until our seasons are flipped and you're enjoying the warmth! 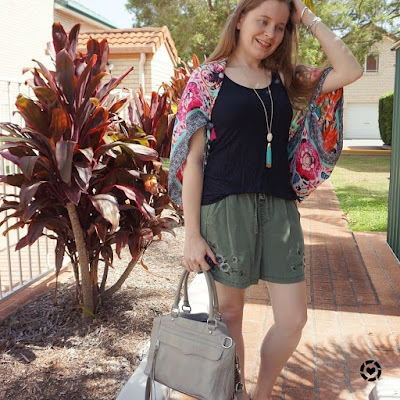 I love that you created a kimono with a scarf, such a great way to get more use out of it! You’ve actually reminded me that I’d want to add some to my wardrobe for the spring and summer. I don’t own any at all! I love the idea of them for all the reasons you’ve mentioned. Thanks for the inspiration and I hope you’re having a great start to the new year! These looks are so perfect for Summer weather! You're making me long for Spring, over here! A loose long layer really is great for some extra sun protection! I love that your kimonos always mix and match so well. I love your looks with the shorts, it looks like stunning weather you're having, super jealous in cold and icy Scotland! Loving the color of that bag! It's so simple and you can put it together with so many different outfits! Wishing you a Happy New Year! You and I share the same love for kimonos, they complement a look so well and there are beautiful kimonos, floral embroidery as well as yours. Your bags always make a perfect match with your outfits. I love the floral design on those shorts! Both super cute looks! Can't imagine myself wearing them now that we're heading to the middle of Winter, haha! haha yes they are summer only pieces here! I think I've worn a scraf as a kimono once! I need to do this again and it really isn't hard to do. I love both of these looks! 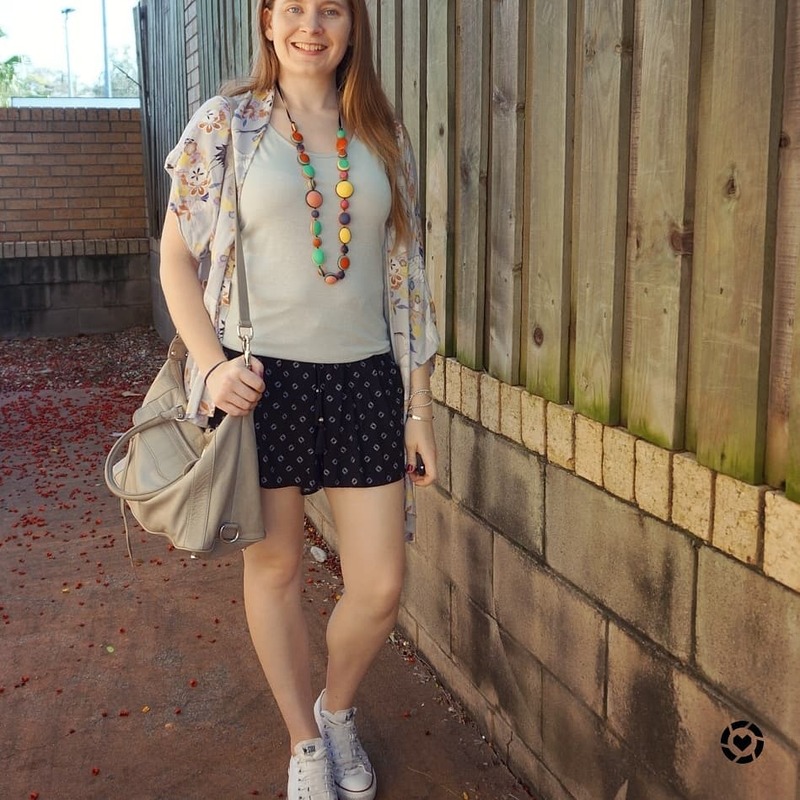 Printed shorts can be such life savers throughout the warmer months of the year, right?! They're super comfortable and help you to beat the heat while still looking stylish :) Happy 2019!! Such a cute idea to use a scarf as a kimono. Both looks came out great. Happy New Year!! That is such a unique and awesome way to reutilise a scarf. I would never have thought to tie it in such a way. A sarong, yes but not kimono. It looks fabulous and I would not have guessed it was a scarf too. Great job! Hope you had a lovely Christmas and Happy New Year. Wishing you and your family all the best for 2019! I love the idea of using a scarf so many ways. Your scarf is gorgeous! Both of your kimonos are so pretty! I love the way you kept your clothes and bag neutral and really let them shine! Hope you had a wonderful New Year!! It really is! can't wait to wear it as a scarf when it gets colder! I love how you wore your scarf as a kimono. I'm definitely going to have to try that in the summer. Kimonos are such a beautiful way to add to an outfit and you wore both wonderfully. What a good idea making your giant scarf into a kimono!! I never would have guessed it wasn't a kimono! Love it babe! So well put together. I love a good kimono.